The AFC-NFC Pro Bowl returned to Los Angeles for the first time in seven years on January 29, 1979. After regularly being played at the Memorial Coliseum for 22 seasons, the annual all-star contest had been held in six different NFL cities since then. The contest also marked the first time that players wore their respective team helmets rather than helmets with logos designed for the game. There were 38,333 fans in attendance at the Coliseum on a chilly 45-degree Monday night. Los Angeles Rams season ticket holders had been required to purchase Pro Bowl tickets, and some 13,310 tickets went unused. The first quarter was scoreless, with the AFC failing to convert a fourth-and-seven play at the NFC 36 and Frank Corral of the Rams missing a 37-yard field goal attempt for the NFC. In the second quarter, after Miami’s Garo Yepremian was short on a 47-yard try for a field goal, the NFC drove 70 yards in 11 plays. QB Archie Manning of the Saints completed four passes and RB Wilbert Montgomery of the Eagles, who had a 17-yard carry along the way, finished the series off at 7:06 into the period with a two-yard touchdown on a fourth down play. However, Corral missed wide on the extra point attempt. The AFC came right back with a nine-play, 62-yard possession. With less than four minutes remaining in the first half, QB Bob Griese of the Dolphins threw to Seattle WR Steve Largent for back-to-back gains of 27 and 10 yards, and finished off the series with a throw once more to Largent for an eight-yard touchdown. Yepremian added the extra point and the AFC held a 7-6 lead at halftime. In the third quarter, and following a shanked 16-yard punt by Oakland’s Ray Guy, the NFC was backed up by a holding penalty but then proceeded to advance 55 yards. 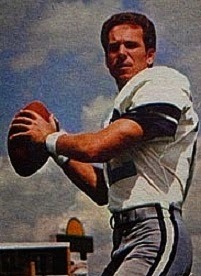 Dallas QB Roger Staubach (pictured at top), who was ineffective in the first quarter, completed five straight passes in the series. Two were to WR Ahmad Rashad of the Vikings for 15 and 17 yards and, following a six-yard run by Montgomery, Staubach connected with WR Tony Hill, a Dallas teammate, in the corner of the end zone for a 19-yard touchdown with 3:43 remaining in the period. Corral converted this time to give the NFC a six-point advantage, and in the game dominated by defense, that was enough. The teams traded punts as the contest entered the fourth quarter and a Manning pass was intercepted by SS Bill Thompson of the Broncos at the AFC 16. But following one more AFC possession, the NFC was able to control the ball for the last 6:20. They had an opportunity to add more points in the last minute, reaching the AFC five yard line, but Manning fell on the ball twice to run out the clock. The NFC won the low-scoring contest by a final score of 13-7. The AFC led in total yards (320 to 296) and also had the edge in first downs (18 to 17). 169 yards of the AFC’s total came on the ground, against 151 passing yards, while the NFC threw for 199 yards and rushed for 97. The NFC turned the ball over twice, to one turnover suffered by the AFC. Roger Staubach completed 9 of 15 passes for 125 yards and a touchdown while giving up one interception. Archie Manning, who played the second and fourth quarters, was 8 of 17 for 78 yards and also had a pass picked off. Wilbert Montgomery ran for 53 yards on 9 carries and RB Tony Dorsett of the Cowboys gained 27 yards on 7 rushing attempts. 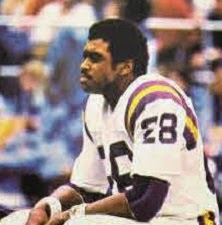 Ahmad Rashad had 5 pass receptions for 89 yards and was named Player of the Game. G Tom Mack of the Rams finished off his Hall of Fame career with an 11th Pro Bowl appearance and received a standing ovation from the Los Angeles fans with a minute remaining in the contest. For the AFC, Terry Bradshaw was successful on 8 of 17 throws for 54 yards and no interceptions. Bob Griese threw 20 times with 10 completions for 122 yards and a TD and also gave up no interceptions. Houston’s star rookie RB Earl Campbell rushed for 66 yards on 12 carries to lead both teams. Steve Largent, the first Seahawk to appear in a Pro Bowl, caught 5 passes for 75 yards and a touchdown, all in the second quarter. The win gave the NFC a 5-4 lead over the AFC since the restructuring of the Pro Bowl into AFC vs. NFC in 1970. The game moved to Honolulu the following season, leaving the Memorial Coliseum once and for all.